Give this Triple-Chocolate Tres Leches Cake three chocolates & three milks! 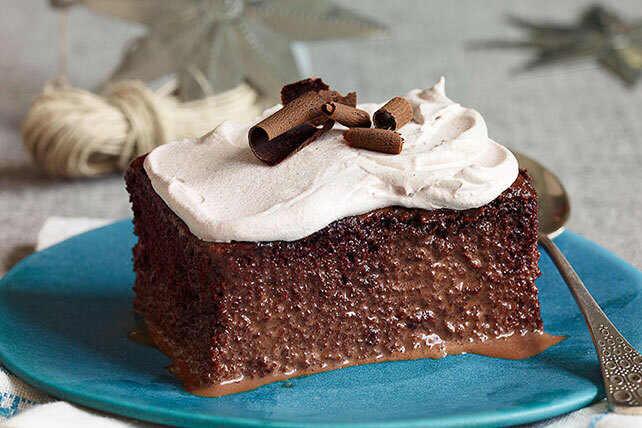 This extremely moist Triple-Chocolate Tres Leches Cake is a five-star dessert. Prepare cake batter and bake in 13x9-inch pan as directed on package. Cool cake in pan 10 min; pierce with large fork at 1/2-inch intervals. Melt 7 oz. chocolate as directed on package. Blend milks and sour cream in blender until smooth. Add melted chocolate; blend well. Pour over cake, re-piercing cake if necessary until milk mixture is absorbed. Refrigerate 1 hour. Meanwhile, make curls from remaining chocolate. Stir cocoa powder into COOL WHIP; spread onto cake. Top with chocolate curls. Keep refrigerated. Tres leches means three milks in Spanish. It is a deliciously moist cake with a distinctive wet texture. Microwave chocolate on HIGH for a few seconds or just until you can smudge the chocolate with your thumb. Hold the chocolate steadily and draw a vegetable peeler slowly across to form curls.